Chicken Korma in coconut milk!!!!!!!! 1. Marinate the chicken with onion paste, ginger paste , garlic paste and whole garam masalas. 2. Heat oil and add the chicken with the marinade . Add little warm water. Cover the lid and cook on medium low flame . The chicken will release water too. When the water is reducing, add hot water. Cover the lid and cook . 4. Add handful of green chilies . Put 1 or 2 tbl spoon of ghee and cover the lid. Turn off the heat . And keep that on the stove until you serve. Sprinkle keora water before you serve . 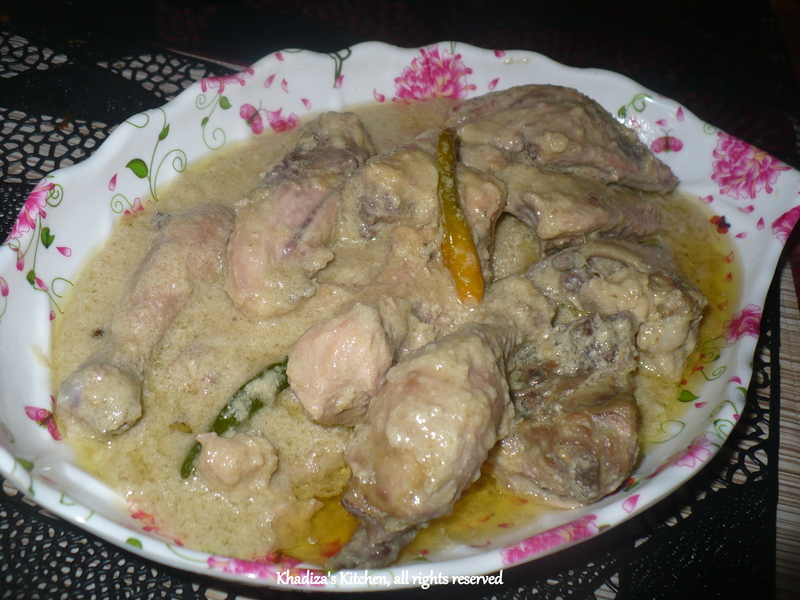 This entry was posted in Chicken, Chicken and Poultry and tagged Chicken Korma, Chicken Kurma, Chicken Recipe, korma in coconut milk, Korma recipe, kurma recipe. Bookmark the permalink.